There is a commercial on TV that features a popular professional golf player chastising a casual golfer who has just kicked his ball away from a tree. This cracked me up the very first time I watched. That commercial goes through my head every time I go out on the course. 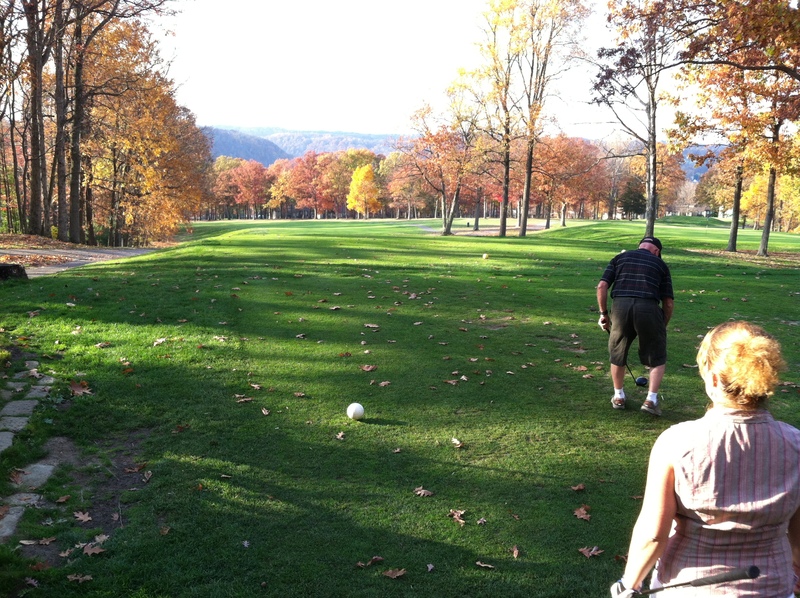 There are several beautiful golf courses here in Morgantown. I’ve had the pain and pleasure of playing three of them. Pain because I am a beginner and they are difficult for me to play and pleasure because each is lovely and I enjoy playing golf. This is a surprising phrase as I “never” thought I would actually go out and play the game. Rule #1: Never say “never”. My first attempts at using a set of golf clubs came in high school. I was not an athlete; so when the choices available for our P.E. class were coed volleyball, field hockey, or golf, I determined that golf presented the least likely scenario for broken bones and signed up. Week 1: learn to grip the club and practice swinging at an imaginary ball – wow; I was pretty good at this already! Week 2: place a REAL ball on a rubber mat in front of you and hit it. This was my downfall; no matter how hard I tried I simply could not hit that little ball. Week 3 came and went; my classmates were learning different clubs and perfecting their swing, I still hadn’t hit the ball. Week 4: field trip to the local golf course to apply what was learned. I, however, was left behind at the school to continue to attempt to hit the ball. So, as you may have deduced, I never hit the ball. In the instructor’s words, “Maybe you shouldn’t play this game.” Rule #2: Learn in the right atmosphere with someone who can give you valuable insight. In all my years in Wyoming I never attempted to play golf again, but I didn’t feel that I was missing too much. The weather was usually prohibitive and the courses that I was familiar with were not very scenic. My husband liked to play and enjoyed the game with his many friends all over the state. So when he bought a golf glove, I wondered why; when he bought shoes, I thought he was going a bit overboard; and when he shelled out “big bucks” for a new driver and 3-wood – well you can imagine my dismay. About a year ago I tried again to hit a little white ball off of a tee on a West Virginia golf course. This time I used a club from my youngest son’s junior set and had a few tips from my ever-patient husband. The club face came down and actually connected with the ball, it didn’t travel far but I was as giddy as if it had gone several hundred yards! Each consecutive attempt drew me further into a pastime that I hadn’t considered pursuing. Soon I had clubs (shared with my youngest), a hand-me-up glove (also from the youngest), and a good pair of golf shoes. Rule #3: Buy the correct equipment. My husband and I play a few holes nearly every evening and we truly enjoy this activity together. I’m learning the rules and when scoring must take extra strokes for balls lost, hit out of play and into the pond. The game is a sine curve of ups and downs for me, but the challenge of developing my game within the rules is enjoyable. Rule #4: Follow the rules and have fun. As you can see these rules of golf apply in pretty much any situation. Take a chance and try (or try again), get good guidance and tools, and maintain integrity for the best experience. I consider this life lesson while looking down on my ball in the tall grass of the rough. “Go ahead and fluff that ball up a bit, everyone else does.” My husband suggests as I pull my 5-iron from the bag.